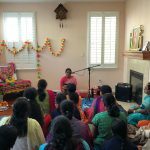 Sri Gayatriji, started her three-day Hari Katha Satsang, by emphasizing the meaning and need of Satsang on Monday, December 4th 2017 from 7pm-9pm at the residence of Sri.Sridhar Venkatraman. She talked about various avatars and how Krishna avatar is so special that, listening to Krishna katha inculcates bakthi in one’s heart.Gayatriji elegantly took the audience to the time of “Krishna Jananam” and explained the series of events that followed the birth of the “tam atbutham balakan.” The event was attended y more than 20 gopakuteeram families. Aarathi and Prasadam were offered to Sri Radha Krishna and Sri Guru Maharaj. Sri Gayatriji continued her second day of her three-day lecture series on Hari Katha at the residence of Gopakuteeram students Shrutika Saravanan and Nimeshikaa Saravanan on Tuesday, December 5th 2017 from 7pm to 9pm. She captured the audience by narrating the bala leela of Sri Krishna which included Pootha moksham, Sakatasura vatham, and Thirunavartha vatham. The satsang concluded with Gayatriji elegantly narrating Sri Krishna’s pranks with gopis. 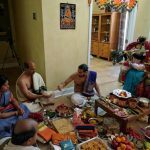 Aarathi and Prasadam were offered to Sri Radha Krishna and Sri Guru Maharaj. Sri Gayatriji concluded her three-day lecture series on Hari Katha on Wednesday, December 6th 2017. 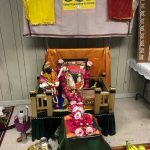 She narrated the “Brahma Mohana leela” and “Agasura vatham.” Aarathi and Prasadam were offered to Sri Radha Krishna and Sri Guru Maharaj.With the blessings of Sri Guru Maharaj and Sri Madhuri sakhi sameta Sri Premivaka varadha takurji, the events in Seattle were blissful.Ananaya Aatreyaji and family hosted this event. 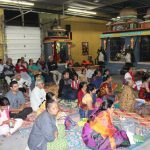 Seattle GOD Chapter offer their pranams onto the lotus feet of our Guru Maharaj, to bless up with many more satsangs.